THIS PRODUCT HAS BEEN DISCONTINUED. We are keeping the page active for customers who have previously purchased the H-Cell and require the manual / operating instructions. H-Cell 2.0 (FCJJ-21) lets you create your own hybrid hydrogen-electric applications. Horizon’s next generation H-Cell replicates the technology of real-scale hybrid vehicles improving electrical batteries with the addition of hydrogen fuel that has extremely high energy density. Acceleration is still drawn from the existing batteries while the H-Cell provides hydrogen power for cruising. 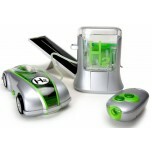 With H-Cell the vehicle can run up to four times longer than with the battery alone. 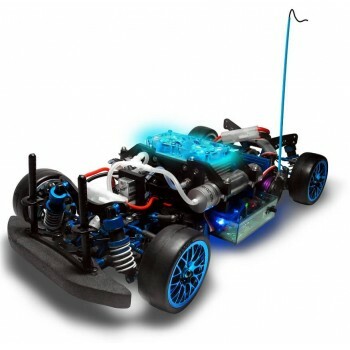 The system is designed with RC hobbyists in mind and is optimized for 1:10 scale vehicles. 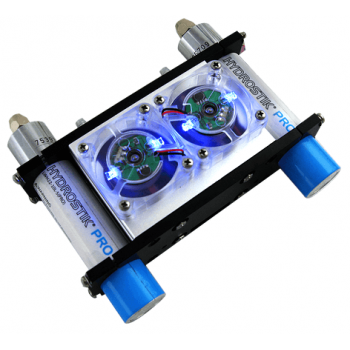 Q: What is the H‐CELL 2.0 hybrid fuel cell power kit and how does it work? 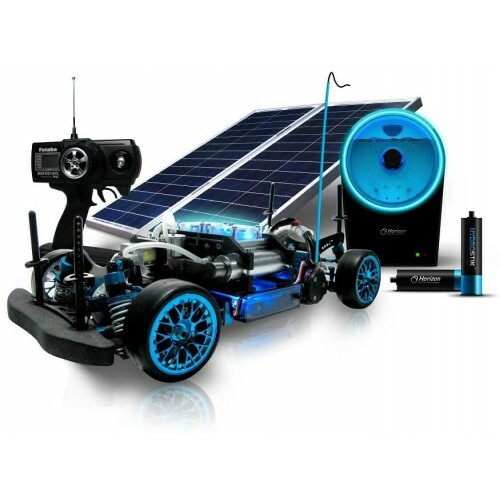 A: The H‐CELL 2.0 hybrid fuel cell power kit is a next generation power system for electric powered hobby‐grade vehicles (including cars, boats and robots). 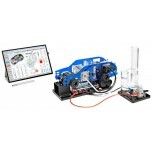 The real‐working power kit mimics the function of real‐scale hybrid fuel cell systems used in developmental hydrogen fuel cell cars. The fuel cell system creates power by combining hydrogen and oxygen from the ambient air. Hydrogen is stored in 2 small cartridges located on either side of the fuel cell (4 are included in the kit). 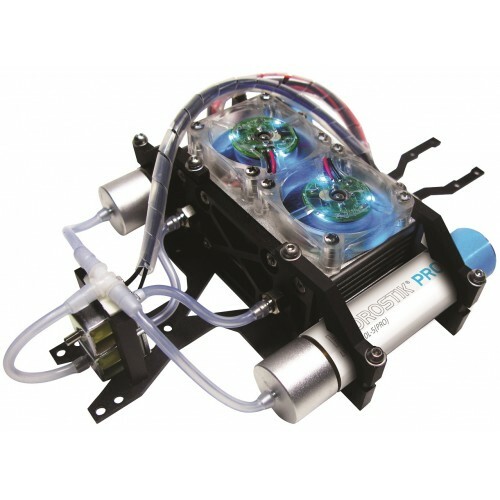 Using a special electronic control box (provided in the H‐CELL 2.0 kit) the fuel cell is hybridized with a typical hobby‐grade battery in order to optimize power and energy, as it is done in the latest hydrogen car designs. The battery provides the acceleration power, while the fuel cell provides cruise power as well as extra energy for the battery. This decreases the amount of batteries needed, eliminates the need to charge batteries, and provides much longer run times for the vehicle (factor of 3 to 4). Q: What kind of speed or other performance improvements can I expect? A: This will depend on your choice of motor, chassis performance and integration improvements. The TAMIYA TRF416X, which was used as our design platform is known to have raced in excess of 50‐70 mph using high performance DC brushless motors. The vehicle with the fuel cell system add‐on brings more weight which reduces acceleration speed – however the car will run close to one hour on a single full charge after repeated testing, which is about 4 times the normal runtime of a battery‐only vehicle. For endurance racing, the H‐CELL 2.0 is the system of choice. Q: What is included in my H‐CELL 2.0 power kit? 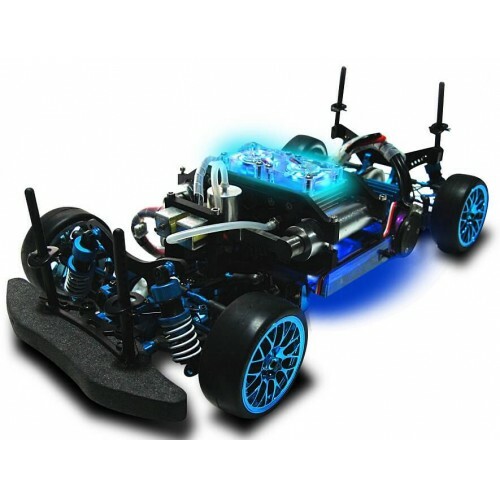 As an add‐on, the H‐CELL 2.0 will require the user to already own an electric touring car chassis (we recommend the TAMIYA TRF 416/X around which the H‐CELL 2.0 was designed, although expert hobbyists can adapt the power kit to other platforms), brushless motor, servo motor, transmitter, receiver, wheels and other components. We provide a list of all recommended components and chassis in the power kit’s user manual. 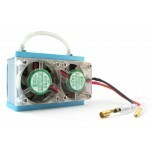 Q: What is the type of fuel cell that is used in the H‐CELL 2.0 power kit? A: The fuel cell used is an air‐cooled, air‐breathing, self‐humidified, Polymer Electrolyte Membrane Fuel Cell (PEMFC), which is the same type of fuel cell used in real‐scale fuel cell car developments. The fuel cell runs on pure hydrogen. Q: How is the water (H2O) by‐product released from the fuel cell system/car? A: There will be a tiny quantity of water coming out as water vapor during the running of the fuel cell, but the quantities are such that it will not be noticeable. 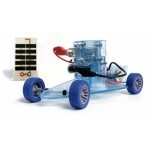 Q: Can I use only the fuel cell to run my RC vehicle (without the hybrid battery)? A: The H‐CELL 2.0 is a hybrid electric power kit that combines the high energy density characteristics of hydrogen with the high power discharge of batteries. The car’s electric motor will be drawing acceleration power from a battery while the fuel cell is used for cruise power. The electronically controlled system offers an optimized system design, which is compact, fast, and high endurance – it enables existing battery‐only systems to run three to four times longer on a single charge, by managing the energy on‐board the vehicle depending on status of acceleration/cruise. Q: Can the car run if its hybridized battery is fully discharged? A: The H‐CELL 2.0 power kit needs the battery to be charged to function properly, and it will use its hydrogen reserves to automatically charge the battery when it discharges. If the battery is fully discharged, we recommend activating the fuel cell system and waiting for 30 minutes or so for the hybridized NiMH or Li‐Po battery to charge. Q: What is the role of the electronic control box (included in the H‐CELL 2.0)? A: The electronic control box actively manages the energy consumption in the car from battery or from fuel cell depending on the status of acceleration or cruise, or the power draw from the motor in general. The electronically controlled system is able to manage energy in order to greatly increase runtimes of the entire vehicle, up to a factor of 3 or 4. Q: What is not included in my H‐CELL 2.0 power kit and where can I find these? A: The vehicle, motor, receiver, transmitter, servo motor, HYDROFILL hydrogen station and solar panel accessory are sold separately. The HYDROFILL and Solar Panel accessory can be purchased from us directly (contact us at sales@fuelcellstore.com), and the other components listed in the following can be purchased from most hobby stores near you, or your local web‐based hobby component suppliers. All parts as above can be purchased for you and a complete working assembly of this showcase vehicle. If you would like the Fuel Cell Store to help you source all parts and assemble a ready‐made car platform, please contact us at sales@fuelcellstore.com. 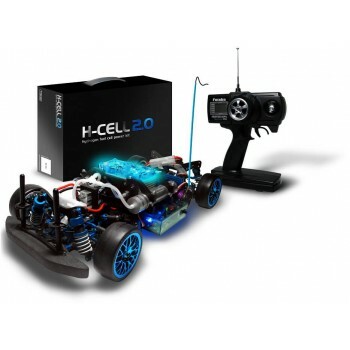 Q: Can the H‐cell 2.0 power kit apply to other model RC vehicles? A: The H‐CELL 2.0 system design and integration has originally been designed using the TRF‐416X chassis from TAMIYA. 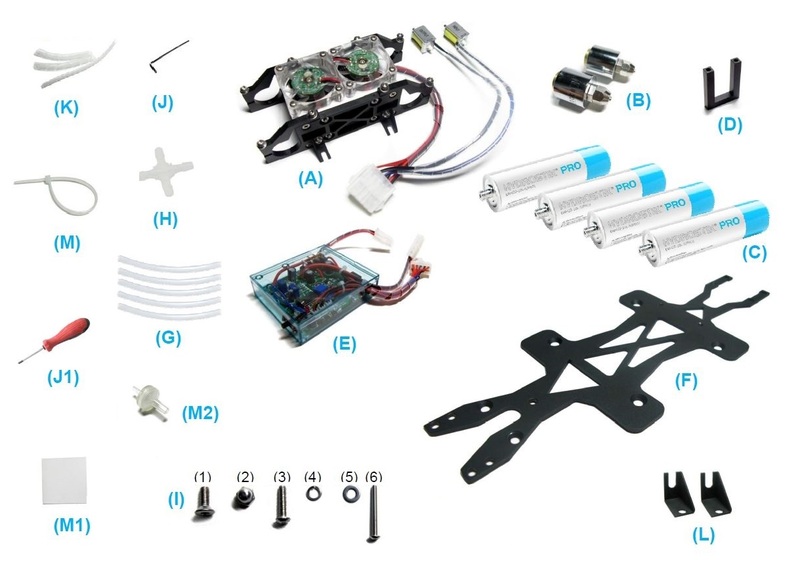 With some modifications, as long as your vehicle is using an electric motor and a battery based system, the H‐CELL 2.0 parts can be made compatible (with some garage work!) to other vehicles including cars, boats, and robots – for example. Q: Is it possible to receive spare parts in the future? 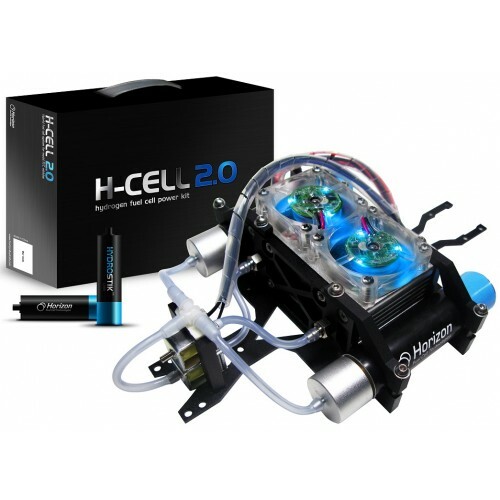 A: The Fuel Cell Store can provide spare parts for any of the items contained in H‐CELL 2.0 at anytime; just send us any of your special requests to sales@fuelcellstore.com. Q: How is hydrogen stored? A: The hydrogen is stored in small cartridges (HYDROSTIK) at low pressure. When refueling, hydrogen gas is sent at high pressure into the cartridge, but the gas is adsorbed onto the surface area of a special alloy metal which is contained inside the cartridges ‐ becoming a solid (hydride). This is the safest form of hydrogen storage since it is not stored at high pressure. When connected to the fuel cell, the small hydrogen tanks slowly release hydrogen using a heat exchange process with the ambient temperature. Q: How can I refill the HYDROSTIK with hydrogen? A: When hydrogen runs out, it is possible to refill the HYDROSTIK using a revolutionary desktop hydrogen station. The refueling station is called HYDROFILL and comes with a standard AC plug‐in system. All you need to do is add water to its reservoir, screw in the empty HYDROSTIK cartridge, and power on. The HYDROFILL will remove oxygen and hydrogen from water, sending hydrogen into your HYDROSTIK cartridge. It will take one hour to fill a HYDROSTIK 100%, and just 20 minutes to fill it by 50%‐60%. You can charge the hybridized battery separately, or use the fuel cell to do this. 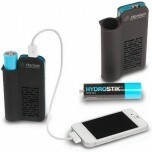 Always keep your 4 HYDROSTIKS fully charged for fast replacement during racing. 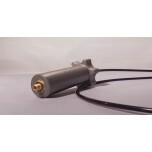 It is possible to connect your HYDROFILL to solar or wind power systems that have been specially adapted. Horizon will supply several renewable options in this regard, the first one being a solar power system. Q: I have an older version hydrogen storage cartridge, not the newly introduced HYDROSTIK PRO. Will the HYDROFILL hydrogen station refuel my older version cartridge? A: No, this will not work. The new HYDROSTIK PRO cartridges have been designed over the past 2 years and use new materials, new connectivity designs and do not have the same refueling characteristics. We recommend only using Horizon’s new HYDROSTIK PRO storage cartridges as they will also be relevant for other applications/products to be developed by Horizon. Q: How long does it take to refuel one HYDROSTIK cartridge if I use the HYDROFILL? 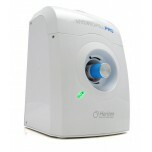 A: The HYDROFILL PRO is able to deliver a hydrogen flow rate of 10L per hour. It therefore takes about one hour to refuel one HYDROSTIK fully using the HYDROFILL. Q: Which purity grade will the hydrogen that is produced by the HYDROFILL be? A: The purity of hydrogen is 99.9% under room temperature. This will not have negative effect on the PEM fuel cell regarding lifetime, power rating – since the metal hydrides contained in the cartridges first adsorb the hydrogen, and then release it at a high purity (99.999%) into the fuel cell. Q. How many times can use the HYDROSTIK refillable hydrogen storage cartridges? 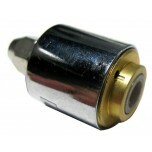 A: The cartridges are designed for use 100 times, after which the cartridge will degrade in performance. It is possible to purchase further HYDROSTIK cartridges separately from Horizon at any time. Please note that the HYDROSTIK does not contain any dangerous chemicals and is 100% recyclable. Q: Is it possible to produce renewable hydrogen fuel using solar or wind power?